We are fully capable of handling all of your metal building needs. With over seventy five years of combined experience in the metal building industry, The Rogers Group name has become synonymous with quality metal building projects. From a small residential garage to a large commercial warehouse facility, The Rogers Group strives to be your preferred metal building contractor. With such an emphasis being placed on time and materials during a construction project, a metal building is a superior alternative to conventional construction methods. Some of the benefits of metal building construction include: Erection and Material cost are lower than conventional methods due to the originating costs and reduced labor. On average a metal building can be erected and completed in approximately two-thirds the time required for conventional construction. 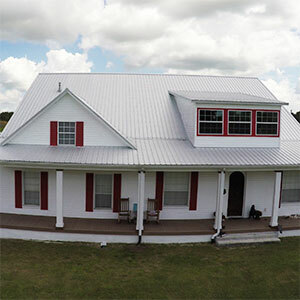 Although the appearance of a metal building has always been considered the major setback for the industry, with today’s advancements a steel building can easily be enhanced with stucco, brick, stone or almost any other decorative finish. The “Green” benefits of a metal building are currently somewhat unknown to the public. If you consider the lifetime of the building and the recycled materials used to manufacture some of the steel and building components, metal buildings are becoming a very popular “Green alternative”. The warranty on a quality metal building is on average twenty five years and in some instances as much as fifty years. Combined with today’s building advancement, a metal building is now a premiere and plausible alternative to conventional construction methods. The Rogers Group has years of contacts within this growing industry and is capable of handling your project no matter the size. Ask us today about our Church and Agricultural discounts being offered on our metal building construction.